The Mohaka feral sheep flock is just one of several of Merino type known to have occurred at various times in Hawkes Bay. They evolved around the Mohaka River area behind the historic Tutira sheep station. 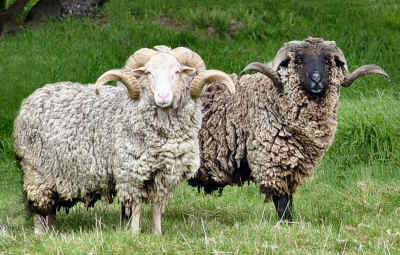 The breed is probably of considerable age – feral Merinos were described from this area as early as the 1880s and Merinos were no longer being farmed there to any extent by 1900. In 1976, scientist Tony Whitaker described the feral Mohaka sheep as comprising several groups which may or may not be discrete, on or near the banks of the Mohaka River between the Te Hoe and Waipunga Rivers behind Tutira. There appeared to be fewer than 1000 sheep spread over an area of 30 000 hectares. Their numbers seemed to be diminishing due to habitat destruction as the land was being developed for farming (see » About Feral Sheep for reference). Mohaka sheep can have either black and white wool. Several small breeding groups are maintained in captivity by Rare Breed enthusiasts.